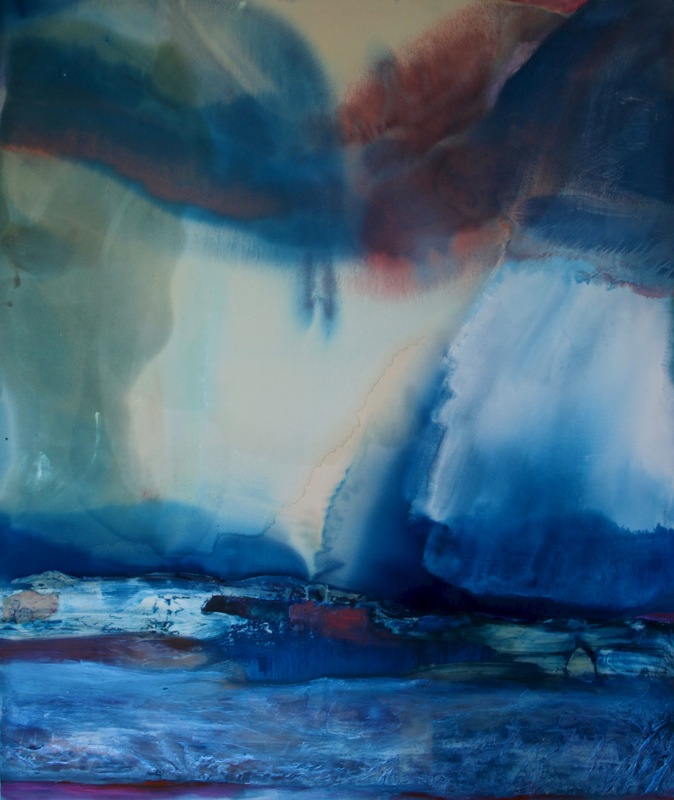 In her most recent suite of mixed media paintings, Dana James employs alluringly deliquescent strata of oils, inks, dyes, encaustic and pigments in the creation of landscapes, seascapes, skyscapes and spacescapes that whisk you away into the turbid beyonds of ambiguously horizoned, chromatically enchanted elsewheres. James’s lush palette of peachy pinks and deep blues, emerald greens and purpled greys, earthy oranges and icy teals, smoky blacks and creamy, pearlescent, ivory-scale whites calls to mind the teasing, fleeting, atmospherically supple theatrics of celestial candescence of certain seasons or at certain latitudes, and her nimble, almost imperceptible handling seems nearly to convey that these works were never manually made, but rather conjured into existence. We climb and we sail as we navigate these realms, and we swim and we float, we fly and we soar, we dash and we drift, and only occasionally and just barely do we alight upon some solid surface — perhaps an island or sandbar, a hillock or glacier — or encounter the circumstantially candid linearities of tenuous, fragile lines. If ever we’re grounded, the ground beneath us seems curiously aloft. If these spheres have gravity, they haven’t much. In James’s kingdom of elegantly fantasized ethers, the lands and skies themselves are the timeless castles. These fresh and assertive paintings are James’s strongest work to date, and they are arresting and transporting all at once. If colors dream, this might be what they dream. Perhaps James sometimes sees these dreams. This essay was composed for the exhibition catalogue accompanying Dana James: Sometimes Seen Dreams, the artist’s solo show at The Lodge Gallery, on view from 18 October to 12 November, 2017. More information about the show can be found here. Images courtesy the artist and The Lodge Gallery. Paul D’Agostino, Ph.D. is an artist, writer, translator, curator and professor living in Bushwick, Brooklyn. More information about him is available here, and you can find him as @postuccio on Instagram and Twitter.